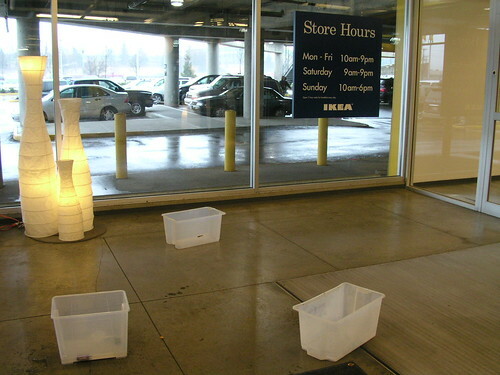 Having experienced both Ikeas this weekend, the results of Ikea vs. Ikea have been tallied and the winner of best Lower Mainland Ikea are in. Coquitlam Ikea wins the coveted best GVRD Ikea title. Cutest Clientele (Richmond): c’mon, gay guys in argyle sweaters with ripped jeans and booties? Coquitlam ain’t got none of those! Parking (Coquitlam): only one dazed older gentleman driving around in circles, instead of the hordes of bad drivers fighting for the rare empty stall. Store Layout (Coquitlam): plenty of room to maneuver. More items on display – we found the stool of our dreams at the Coquitlam location after scouring the Richmond location. Crowding (Coquitlam): plenty of room to maneuver. Restaurant (Coquitlam): er, we never tried the Richmond restaurant. Anyhow, the macaroni and cheese is the best thing to have come out of Sweden. Friendliest Check-Out Experience (Richmond): jolly cashier dude phones other cashier dudes to point out the Edmontonian booties, then shares the joke with the other customers. The Coquitlam Check-Out gal was a no-frills, by-the-book automaton. Efficient but hardly providing local colour.